#bedtimestories is a feature in which writers reminisce about their favourite work of children’s literature they read or had read to them as a child and why it remains so important to them today. We could go on about it a bit more but that’s about it really. What were your favourite bedtime stories? Let us know in the comment section below. I was a demanding child. I would throw tantrums when my mum wouldn’t let me go out of the house in my (awkwardly transparent) Princess Jasmine outfit, or when my dad wouldn’t play with my Sylvanian families with me in the dolls house. The same went for bedtime stories. My mother, poor woman, would have to read my favourite stories, go on bear hunts and say good night to the moon all before I would even consider brushing my teeth. It was all part of the routine. As I grew up, the tradition stuck, and it wasn’t until the brink of middle school that I decided I was too cool for it all. But one character sticks in my mind as my favourite of all. She was Sheila Rae, a small rat (yes, I know, not the most likely of idols) who wasn’t afraid of anything. There was a song in the accompanying ‘sing-a-long CD-ROM’ in which Sheila Rae bragged that she wasn’t afraid of the dark, lightning, witches, lions, OR spiders; which, for a four year old, meant she wasn’t afraid of anything. She could do cartwheels, a skill that I would practice over and over again in my living room (sorry mum), and she stood up to the boys who stole her jump rope. She was a bit reckless, but I desperately wanted to be Sheila Rae. Just after my fourth birthday my family moved to the suburbs of Holland, to a small town called Soestdijk. It was very far from the tropical Singapore we had left behind, and all the other kids were better than me at hopscotch and jump rope. My parents enrolled me in a Dutch primary school before I could speak a word of Dutch, and as an utterly stubborn child, I refused to speak until I was fluent. The subsequent six months of my life were spent largely in the company of my old friend Sheila Rae. While the Dutch kids went out to play “knikkeren”, which means ‘marbles’, I would sing myself the Sheila Rae songs about being brave over and over again. Imagine the scene, it’s really quite tragic looking back now, I was that kid playing alone and singing to herself. “I am fearless I am brave, nothing can make me afraid, I am fearless tra-la-la-la, my name is Sheila Rae”. I eventually learnt Dutch and got really good at knikkeren, so I didn’t rely so much on the company of Sheila Rae anymore. Yet she remained at the back of my mind whenever I had to be brave about anything. Moving again a couple of years later, and starting new schools in England (where apparently hopscotch wasn’t cool anymore) I found myself remembering Sheila Rae’s fearlessness. She was the friend that accompanied me wherever I went, inspiring courage when I only had myself for company. Figgy Guyver is the Deputy Editor of ART & FASHION at Prancing Through LIFE. She’s also the Art Editor of The Student newspaper. In a shocking revelation for Art Editors around the world Figgy is the kind of person you might describe as ‘artsy’. She enjoys the works of Mark Rothko and in her free time wonders how sushi would feel. It is a great question. I read this article and found it very interesting, thought it might be something for you. 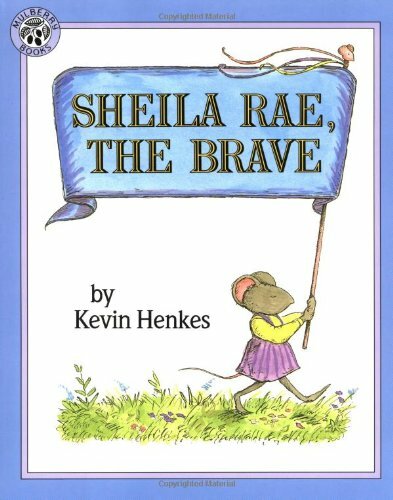 The article is called Sheila Rae, the Brave – #bedtimestories and is located at http://prancingthroughlife.com/2014/03/05/sheila-rae-the-brave-bedtimestories/.